Jan Martenson - Volunteer of the Year! as needed. She trained as a docent and for the last several years has handled the merchandise table at the end of tours. Jan joined the MPPP Board of Directors in 2014 and serves as a member at large and is a member of the Development Committee. Congratulations Jan! 2016 Mesa Prieta Volunteer of the Year! Katherine Wells congratulates Esta Gutierrez and Judith Chaddick on receiving the Mesa Prieta Education Award. Esta Gutierrez and Judith Chaddick, both major contributors to the Mesa Prieta 4th - 7th Grade Curriculum, were recognized for their continuing dedication to introducing the curriculum to Northern New Mexico Schools. The most recent Teacher Training in September, 2016 had eighteen attendees from area schools including eight from Ohkay Owingeh. Congratulations Esta and Judith! 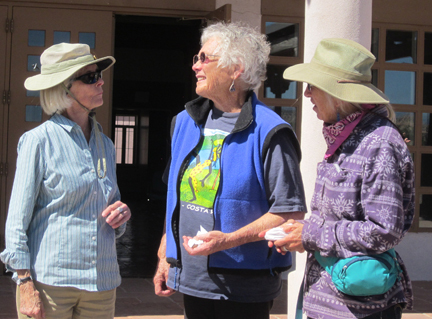 The training was held at the Northern Rio Grande National Heritage Area Heritage Center in Alcalde. In 2005, Mesa Prieta Petroglyph Project received a grant supporting the Project Education Curriculum and Part Time Coordinator. Esta accepted the position of Education Coordinator and now leads the curriculum effort by presenting teacher trainings, providing teachers with the printed curriculum, their resource trunks and other materials as well as providing support in the schools as needed. All is provided free of charge. Judith contracted with Mesa Prieta in 2003 to write a curriculum for area schools. Input from a number of Mesa Prieta volunteers continued to build the missive and in 2009, now Project Director Janet MacKenzie conducted a final edit to prepare the document for publication. A recent grant from the NM Historic Preservation Division was applied to include Hispanic translations to several units of the curriculum. The 4th - 7th Grade Curriculum “Discovering Mesa Prieta” is an award-winning interactive STEM-based (science, technology, engineering, math) curriculum that has been used in some 20 Pueblo and community schools since 2003. Each year, more than 200 children are taught heritage ethics and stewardship and visit the petroglyphs on the Wells Petroglyph Preserve. Perhaps another 200 teachers, principals, parents and tribal members gain an understanding of the mesa's significance. 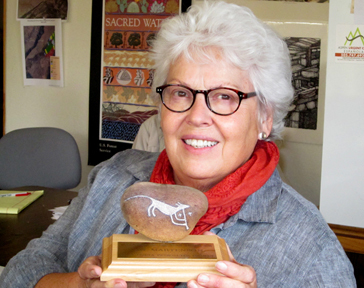 Originally, the content and teaching resources focused almost completely on Ancestral Pueblo petroglyphs and history. In the past several years, units on Hispanic history and culture have been added and translated into Spanish.